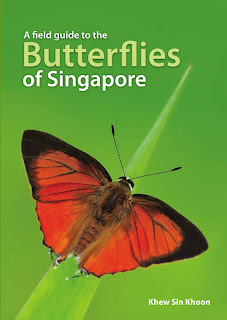 A Field Guide to the Butterflies of Singapore by Khew Sin Khoon. Ink on Paper Communications Ltd, 2010; xxv + 342 pp. Price (in Australia) $50. ISBN 978 981 08 7018 8 (paperback). The city state of Singapore is home to nearly 300 species of butterfly. Perhaps this richness should come as no surprise for a place which styles itself as the ‘Garden City’ and which lies just off the tip of the Malay Peninsula, itself boasting nearly 1000 species; nonetheless it is an impressive total given Singapore’s small area of just 700 km2 and largely urban environment. 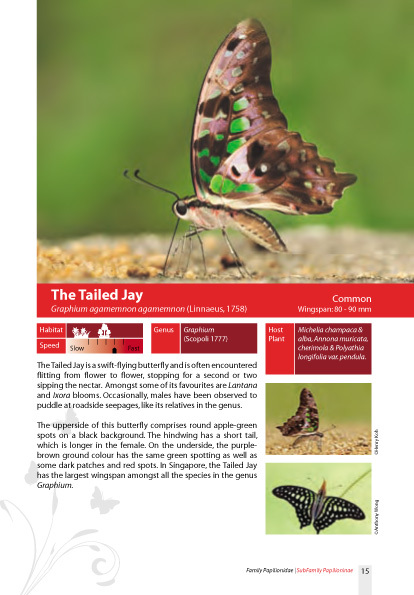 This charming book is the first ever to depict almost all species currently known from Singapore. 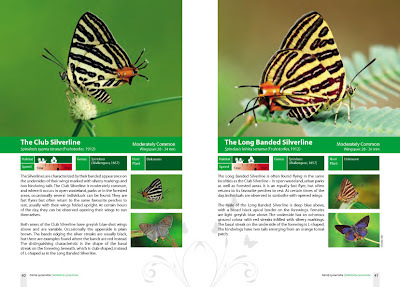 A glossy production in standard octavo field-guide format, it begins with a concise but adequate introduction to the butterflies, covering the topics of nomenclature, adult morphology, early stages, ecology and behaviour, where to find butterflies in Singapore (together with a map of local hotspots) and the techniques of butterfly watching and photography. A lot of information is packed into a very few pages. 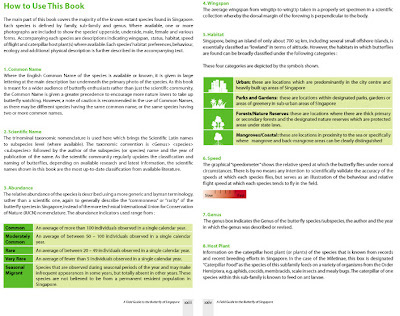 A section on how to use the book explains clearly the conventions adopted with regard to describing abundance, habitat, speed of flight and other information. There follows a family by family, subfamily by subfamily, species by species account. 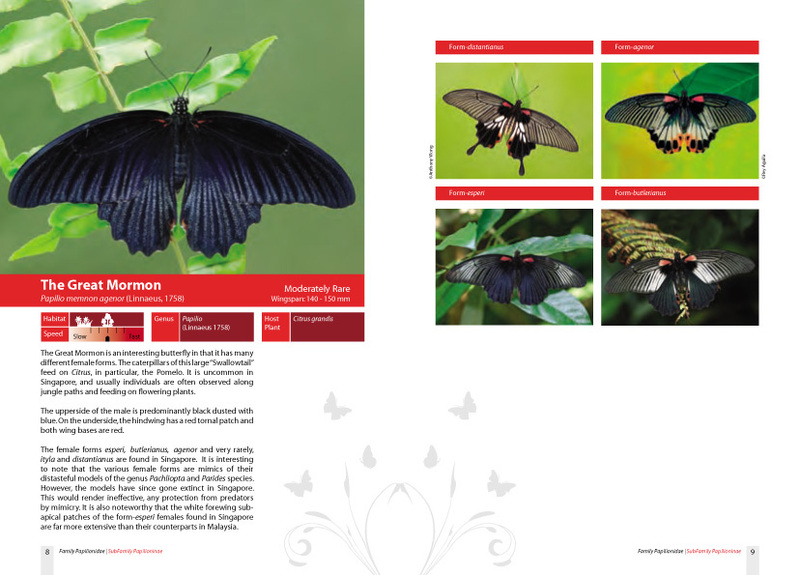 Typically, each species receives a single page, with two pages for the highly polymorphic Papilio memnon agenor (Linnaeus, 1758). 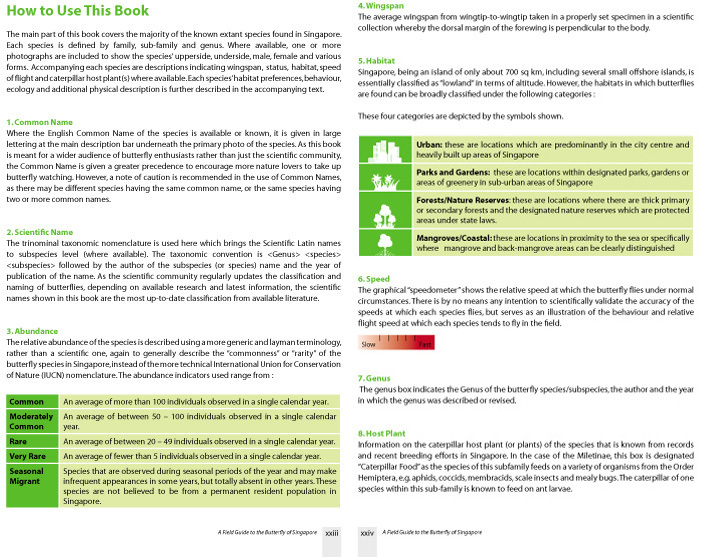 Half the page is devoted to a large scale portrait of the species, typically perching or feeding, occasionally in flight. Virtually every one of these main photos is stunning. In many cases, particularly in the smaller species, individual rows of scales may be discerned, a level of resolution that was almost unobtainable using film. 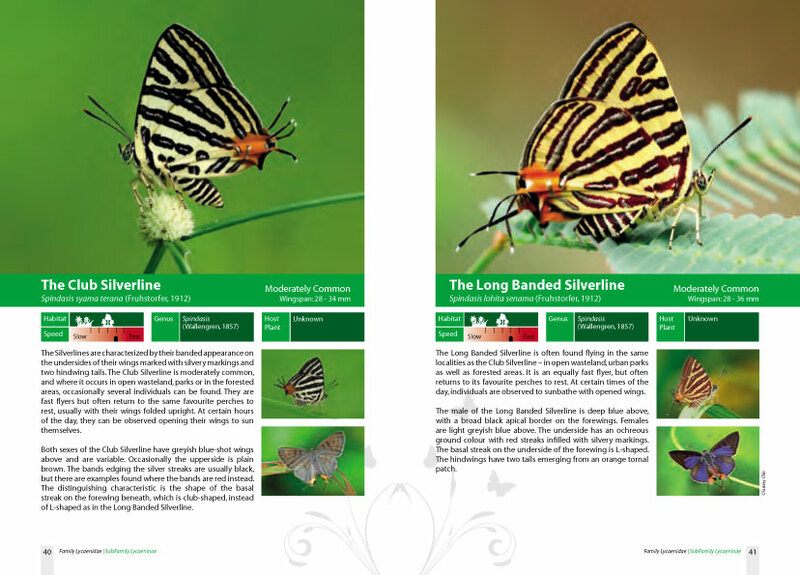 The main image is supplemented by two thumbnail photos, generally showing a different posture and frequently the opposite side of the wings to those depicted in the main portrait. Each species is identified primarily by an English common name. Many of these have been in use for years but a few are of more recent coinage. However, all are evocative and appealing and give the impression that they have established their worth by natural selection within the very active Singapore butterfly interest group. Australian readers may be surprised to find that Graphium agamemnon (Linnaeus, 1758) is known as ‘The Tailed Jay’ and ‘The Palm Dart’ is not Cephrenes augiades (C. Felder, 1860) but Telicota augias (Linnaeus, 1763). In finer print is given the full trinomial designation with author and date, its abundance class, ranging from common to very rare, and its wingspan in mm. (Here forewing length would have been a more useful measure, especially as most species are photographed with wings folded). 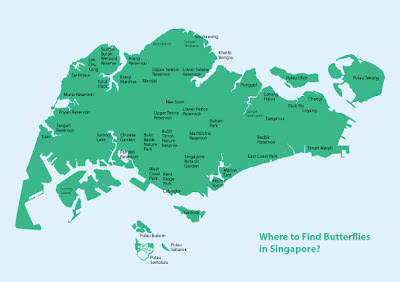 Habitat is indicated by one of four icons: Urban, Parks and Gardens, Forests, Mangroves/Coastal. Speed of flight is shown on a five point scale from slow to fast. Larval hostplants are listed in another small box (with family names sometimes wrongly italicised). A brief text describes habits, habitats and salient identification features. The formula is extremely easy to use and much information can be obtained for little effort. For ease of reference the six families have a colour code visible along the fore edge of the book when closed. The book is very definitely aimed at the butterfly watcher and photographer, rather than the collector. Not a single photograph of a dead butterfly appears within its pages. It will, however, surely become indispensable to every local enthusiast and interested visitor to the island state and be useful elsewhere in the region. Dr Albert Orr is a professional entomologist of 35 years standing. He is a retired lecturer in ecology and invertebrate zoology and has been an Honorary Research Fellow at Griffith University since 1996. Dr Orr is a writer and illustrator, as well as a consultant and scientific editor. 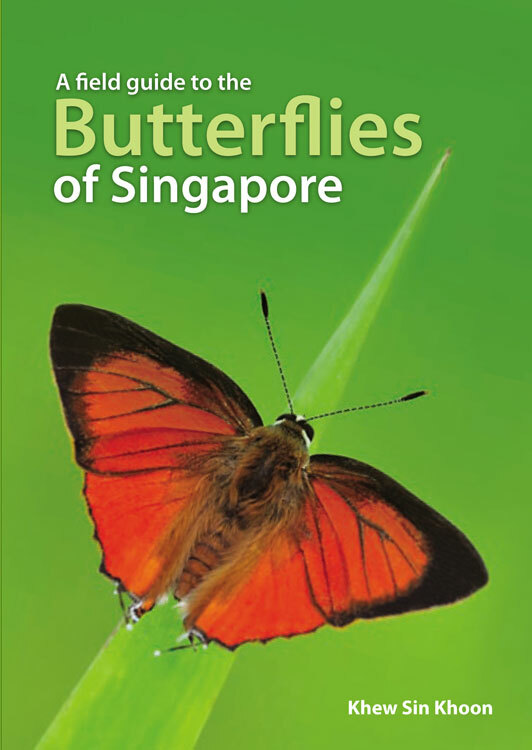 Acknowledgments : Special thanks to Dr Albert Orr for reviewing my "Field Guide to the Butterflies of Singapore" in the Australian Entomologist. The original PDF article can be found here.